Every time I go out for sushi I marvel at the skill of the itamae (sushi chef) making my sushi. He grabs a handful of rice, a piece of fish and in a flash I’ve got my nigiri sushi. He’s a professional and has years of practice and his rolls, sushi, and sashimi come out perfectly. It seems an impossible task to make such exquisite food, however you would be surprised; making sushi at home is not as hard as it would seem. Your rolls may not be perfectly sized and your fish (neta) may be off center, but if you use high quality ingredients and remember a few simple rules, you too can make sushi at home that will satisfy your appetite just as much as going out does. In addition, you can even turn the process into a party with your friends, which I do on occasion. Why not make sushi at home? It’s cheaper than going out and can be quite fun. Plus, you have the opportunity to make combinations or items that may not be available in your local sushi restaurant. Be adventurous. Or not. Some people I know only want California rolls. I, however will try just about anything and use my home sushi making as an opportunity to try things that I would never ask the itamae for. But when you make sushi at home you can tailor your dining to both your comfort level and your wallet. A large piece of hamachi (yellowtail) is actually pretty cheap at my local Japanese market and what would normally be an expensive meal can be fairly inexpensive when I buy the sushi ingredients myself. Remember, your first few attempts may be embarrassing. It’s not a breeze, but the more you make sushi at home the better you will get at it. Try not to get discouraged. Unless you are a professional your sushi will never be perfect, but it can still taste great. 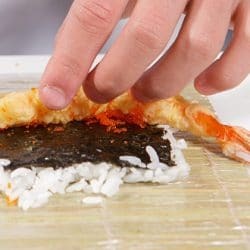 Just make your best attempt, relax, and follow our how-to and you will be on your way to enjoying sushi at home, and the satisfaction that will come with having made it yourself. I suggest reading through the preparation and general tips sections before undertaking making sushi at home to familiarize yourself with what you will need and what to think about as you create your masterpieces. Please keep in mind two very important and related things that seem obvious, but I feel the need to stress. If you plan on eating raw fish at home please make sure that you are buying sushi-quality seafood and that you eat no fresh-water fish raw. The risk of food borne pathogens in fresh-water fish is high whereas the risk is significantly less with fish from the ocean. Also, make sure you are storing and preparing your fish in sanitary conditions to prevent contamination of the food prior to consumption. Wrapped up in the refrigerator on a bed of ice that can drain well is the perfect place. And remember to keep the fish chilled when not in use. This guide is merely for the edification of those who choose to eat raw food at home and I cannot take any responsibility for illness that may result from eating raw fish. It may take time to master your skills, but you should have fun all along the way. Find the link above that corresponds to the style of sushi you are trying to make and read on. Meshi Agare! For those of you who need a ready made sushi kit, Catalina Offshore has everything you need!